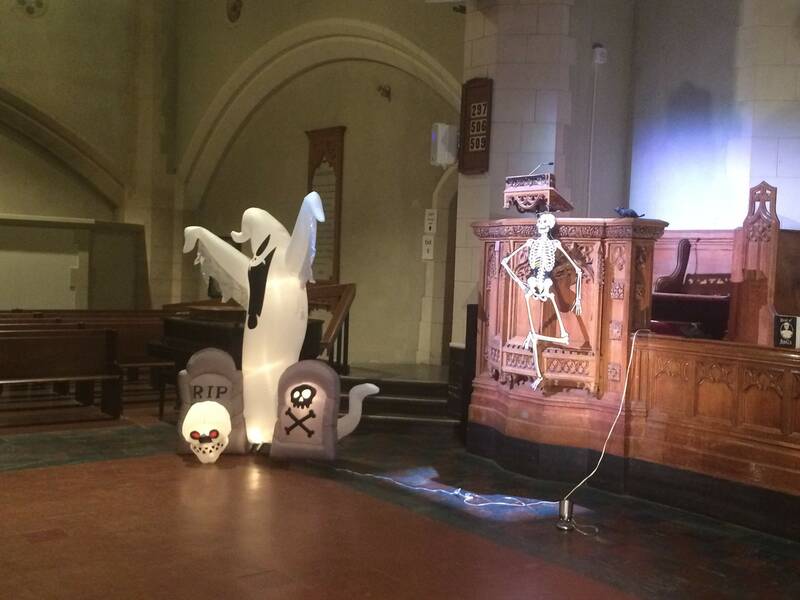 Yet Another Successful Halloween Concert! 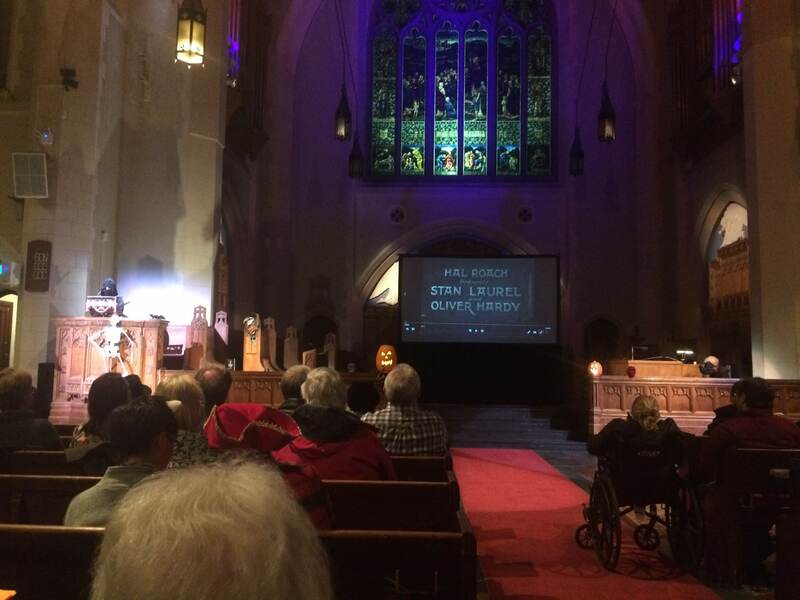 On Friday October 26, the 13th annual RCCO Vancouver Centre Halloween concert took place at St. Andrew’s-Wesley United Church in downtown Vancouver. 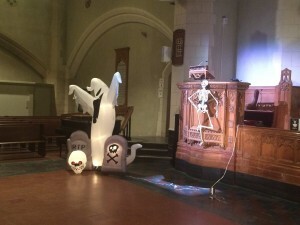 With caretaker Tom Rose controlling the lighting and audio, a large screen in place, lavish food on several tables in the back put together after hours of work by Cindy Leung and her team (Thomas Au, Jenifer and Douglas Airey), and all sorts of spooky decorations ornamenting the area near the organ and console, the scene was set as the audience streamed in. Dani Genossar bravely handled all comers, taking donations and handing out programmes and commemorative booklets on the organ, while Susan Ohannesian concocted the perfect brew (with double bubble toil and trouble) of hot apple cider. Behind the scenes, Sam Balden had spent many hours pondering the best edits for this year’s silent movie: Laurel and Hardy’s Habeus Corpus, so as to trim it to the length needed for the Halloween concert. If there was a category for best editing of a silent film in 2018, he would surely be a contender for an academy award nomination, with Huiyuan Ma the computer-savvy organist responsible for the technical wizardry itself! 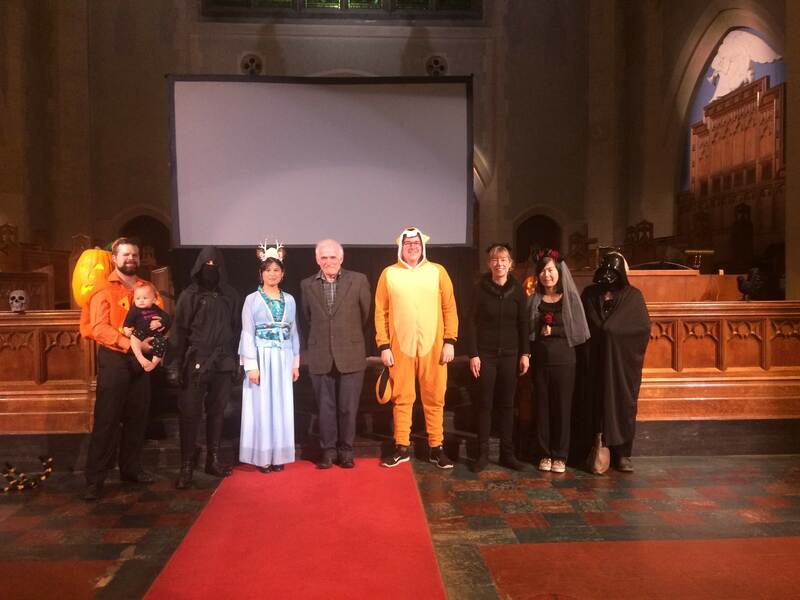 Centre president Michael Molnar was the MC, offering seasonal jokes, poems, and facts about superstitions and mythology, while giving performers time to settle into place and double-check their settings. Rachel Alflatt set the tone of the evening with a grand rendition of Bach’s famous Toccata in D Minor. Her student, Huiyuan Ma carried the D Minor theme further with a lofty Postlude by Bruckner. Beginning the more popular and modern element of the concert, Gail Ovington presented a dynamic compilation of Star Wars themes. To ensure we reached our quota of toccatas, Michael Park next played the famous final movement to Boellmann’s Gothic Suite. Providing striking contrast, John Mitchell followed with the theme made famous by Alfred Hitchcock, the Funeral March of a Marionette by Gounod. Then Angelique Po continued the very French portion of the programme with Gigout’s Toccata (from his gem-filled Ten Pieces). For one last exploration of modern tunes, Michael Dirk delivered a hefty medley of themes from Lloyd-Webber’s Phantom of the Opera. To conclude the segment of pure performances, Darryl Nixon effortlessly conquered the quirky Scherzo by Vierne, and followed it with the mighty Esquisse Byzantine No. 10 by Mulet. 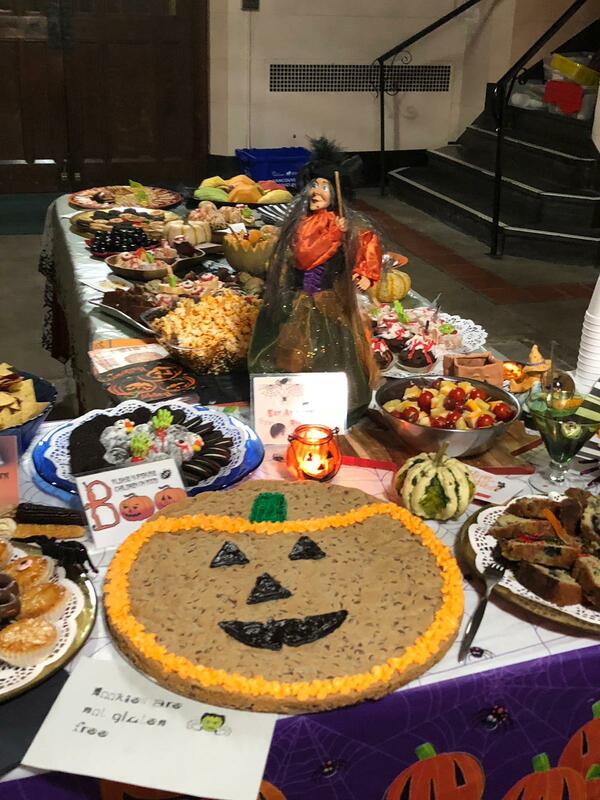 An intermission followed, during which the audience was treated to a wonderful spread of Halloween themed treats. Then, once all was set up and in place, the evening concluded with Laurel and Hardy’s hilarious silent film Habeas Corpus, accompanied masterfully by Edward Norman. 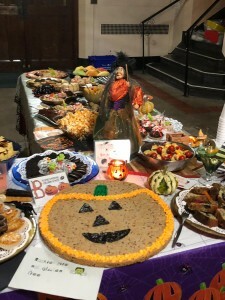 With Halloween jokes and group pictures, the evening came to a close, and the audience of about 150 people happily devoured most of the remainder of the abundant goodies. Seismic upgrades will begin in this venue in the next few months, so this was our last Halloween concert here for at least two years. Organizers Rachel Alflatt and Sam Balden are especially grateful to St. Andrew’s-Wesley United Church Director of Music Darryl Nixon, and to the church’s Sacred Music Series, for their support.